Can be designed to accommodate all types of dock shelter. A large amount of warehouses do not have dedicated loading bays. In these circumstances, there will be a doorway with a roller or external level area without a way to bridge the height difference between trailer and ground. Normally, options for turning a loading area like this into a loading bay would have involved building up the concrete to a height suitable for the trailer or digging down to create a recessed area to build up the loading bay. Both being a significant and disruption process with very high costs. 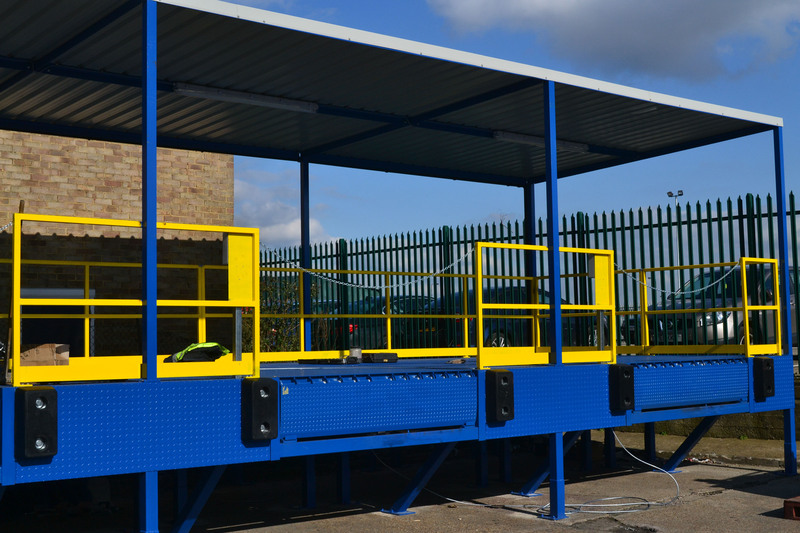 Another solution which we recommend is a bespoke solution which consists of a dock leveller, ramp and platform. Using this combination we can achieve a permanent yte replaceable solution that meets all of the requirements of a traditional loading bay without the enormous costs. Furthermore, the platform being semi-modular allows it to be aligned with the entrance beneath a roller/sectional door. We believe that there is not much difference in terms of practical use and performance, along with reliability; health and safety to a standard non-modular loading bay.